Although never elected to local office, the first American Robert Livingston probably was the most important person to live in colonial Albany. Named in the charter, Robert Livingston was appointed clerk of the city and county of Albany. The clerk registered legal documents and collected a fee for each transaction. That position gave Livingston a hand in many aspects of the development of greater Albany County. He held that office until 1721 when it passed to his son, Philip - who became his Albany-based deputy/surrogate. That office brought the Livingstons in close contact with its appointing authority - the royal governor. 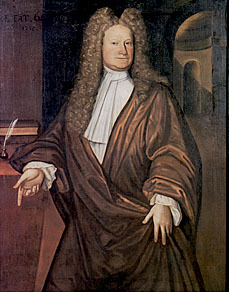 Over the years, Robert Livingston proved of great value to the provincial government as an advisor, emmisary, and even financier. In return, he received land patents including one that created Livingston Manor in 1686, frequent and significant contracts, and a long-overdue appointment to the governor's Council in 1698. Those connections to New York and ultimately to London enabled the astute and shrewd Livingston's becoming the wealthiest person in the upper Hudson region. But they did little to endear him to his Albany neighbors - who never really trusted the Scot and spoke out against him during his increasingly frequent absences. Although established in Albany where his Albany-born wife was raising their family, Robert Livingston's actual business went beyond the city stockade where trading in Anglo American networks kept him in New York and sent him to other cities and abroad more and more after 1690. In the decade that followed, Livingston was closely involved in enabling the overseas mercantile interests of his oldest son John and son-in-law Samuel Vetch and wanted for a surrogate in Albany until second son Philip came of age in 1707. To fill this void, Robert Livingston had brought over his young nephew in 1687. However, Robert Livingston, Jr. proved more interested in furthering his own ends - particularly following his marriage to the daughter of Pieter Schuyler in 1697. Despite raising their large family without much active paternal support, Alida proved adept at upholding the crucial Albany end of Livingston's trading empire until her son was able to take over. By that time, Robert Livingston was most frequently found in his substantial Manhattan townhouse where his trading vessels were moored at his own dock. Then he was building his country estate below Albany on bank of the Roelof Jansen Kil. Although he continued to contribute large sums for Albany's defense and other essential projects, by the 1700s Robert Livingston was represented in Albany chiefly by Alida and her coming-of-age children. This handsome portrait, probably painted by Nehemiah Partridge about 1718, is now in a private collection. We copied the (now best available) image shown here from an unparalleled online resource. The image was described and printed in Ruth Piwonka, A Portrait of Livingston Manor, 1686-1850 (Friends of Clermont, 1986). The definitive work on Robert "The Founder" is Lawrence H. Leder, Robert Livingston 1654-1728 and the Politics of Colonial New York (Chapel Hill, 1961). As a young historian, I was (and remain today) particularly impressed by depth of Leder's scholarship and understanding. The most useable family genealogy is Florence Van Rensselaer's The Livingston Family in America and Its Scottish Origins (New York, 1949). See also, Cynthia A. Kierner, Traders and Gentlefolk:The Livingstons of New York, 1675-1790 (Ithaca, 1992). Also recommended is a major antiquarian history of the family by Edwin B. Livingston entitled The Livingstons of Livingston Manor (New York, 1910). The intent of this sketch of early Albany's most significant individual is to tell his story in an Albany context and to leave the larger (beyond Albany) life of Robert Livingston to his many biographers - beginning with those noted above.